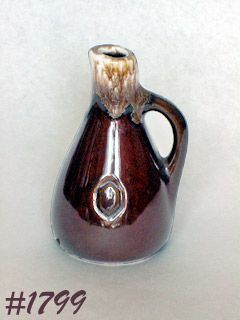 This listing is for a McCoy Oil cruet from the brown drip dinnerware line! Cruet measures 5" tall and is in absolutely mint condition -- no chips, no dings, no cracks, no crazing! 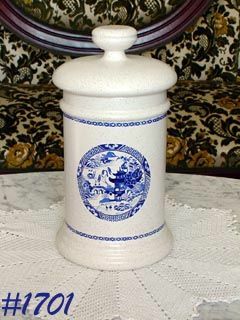 This listing has a mint condition McCoy canister from the very pretty Blue Willow line! Canister is the medium size. It measures 8 1/2" tall (to rim edge) and bottom is marked: McCoy, Ovenproof, USA, 206-M.
Canister is in the apothecary jar shape, color is white with lots of little brown "speckles". The blue willow design is bright and unmarred. Canister is in mint, unused condition -- super! 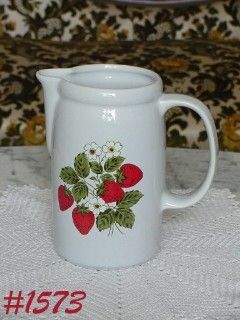 This listing has a mint condition McCoy pitcher from the pretty Strawberry Country dinnerware line! Pitcher measures 7" tall and bottom is marked 1429, McCoy, Lancaster Colony (mark), USA. Decals are bright and unmarred. Pitcher looks new and unused! Another great McCoy trivet in the pretty brown drip colors! Measures 6" diameter, marked on back: 1052, McCoy, Lancaster Colony (mark), USA. Trivet is in wonderful condition with the only evidence of "use" being a couple minor utensil marks -- not uncommon with brown drip items -- that's it! 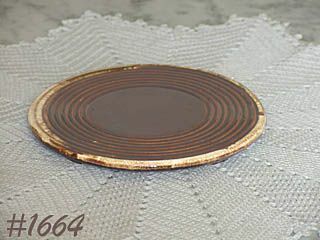 This listing has a very nice McCoy trivet from the brown drip dinnerware line! It measures 6" diameter and is marked on bottom: 1052, McCoy, Lancaster Colony (mark), USA. Trivet is in great condition -- one "foot" has a small rough spot that I believe is production. The only "use" evidence are a couple minor utensil marks that are very common on brown drip items due to the clear over-glaze. Another super nice McCoy mug set! These mugs are from McCoy's pretty fruit festival dinnerware line and have the lighter brown color on top portion. 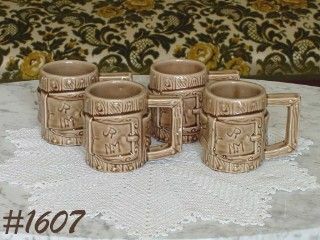 Mugs are the more round shape and are marked on bottoms: 7025, McCoy, Lancaster Colony (mark), USA. Two mugs have the green apple with nuts decals, one has grapes with nuts, and the other has peaches with cherries. Mugs are in great condition -- no chips, no dings, no cracks, no crazing! Super! This is a super nice McCoy coffee serving set -- all pieces are in mint condition! 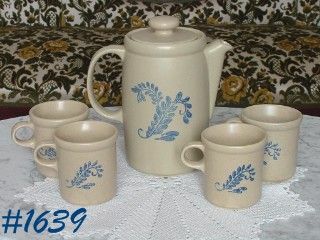 These are from the pretty Bluefield dinnerware line (oatmeal color with blue fern/frond) and the listing consists of a coffee server with 4 cups. 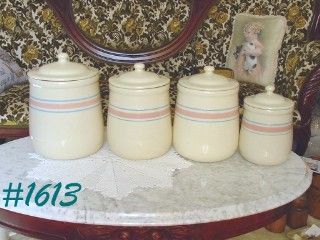 This listing has a McCoy oven proof bowl/pot with lid from the pretty brown drip dinnerware line! It is in mint condition -- still has the original McCoy label/sticker! Measures 5 5/8" tall (to rim), 8" diameter and is marked on bottom: 7079, USA, McCoy (in circle with lines), Oven Proof. 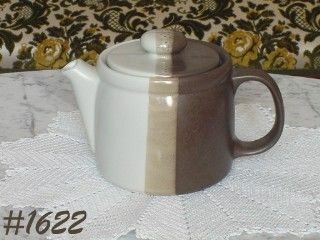 This is a neat McCoy teapot from the pretty tri-color Sandstone dinnerware line! It is in excellent condition -- lid dry ring has a teeny little ding and teapot has a small production rough place on rim -- of absolutely no consequence and really not worth mentioning because the teapot looks new and unused! 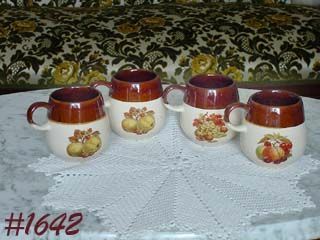 This listing has a set of 4 mugs from McCoy's Western Ware dinnerware line! These are very nice and are in the light brown color. Mugs measure 3 3/4" tall and are marked on bottoms: 934, McCoy, Lancaster Colony (mark), USA. They are in great condition -- have a few minor dings on dry setting ring and one has a production small chip on handle that was fired on, a typical McFlaw. These are neat items from a dinnerware line that did not have a large variety of items. This listing has a set of 4 corn on the cob plates from McCoy's pretty brown drip dinnerware line! They measure 8 3/4" x 3 1/4" and are marked 7316, McCoy, USA. Plates have very pretty color and crisp, clear mold design. With the exception of minor marks caused by stacking them together, these plates are in mint condition. They appear to be new and unused. 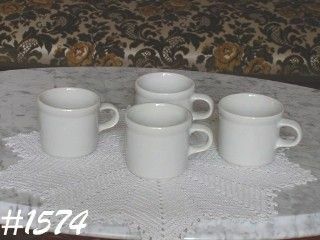 This listing has a super nice set of 4 McCoy cups! 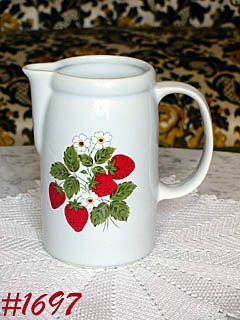 These are white with blue tinge/cast (like Strawberry Country -- without the strawberry decals). Cups measure 3" tall, 3 1/4" diameter and are marked on bottoms: 286, McCoy, Lancaster Colony (mark), USA. They are in mint condition -- two cups have two small production glazed over stress marks on rim -- typical McFlaws, not detrimental in any way and really not worthy of mention! 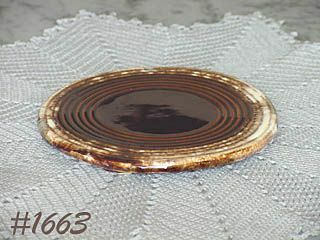 This listing has a set of four large size McCoy au gratins in the very pretty brown drip colors! Measure 10 11/16" long from end to end, 5 1/4" diameter (at center). Bottoms are marked: 7033, McCoy, Lancaster Colony (mark), USA. This is indeed a find -- a set of 4 McCoy cups with the Blue Willow design! Cups measure 3 1/4" tall, 3 1/4" diameter, and are marked USA. The Blue Willow decals are beautiful and unmarred. The cups are an off-white color with shiny over-glaze. They are in wonderful condition -- 2 have a small 1/8" ding on rim edge -- that's it! Because of the rarity of these mugs and the size of the dings, I would rate them as non-detrimental. 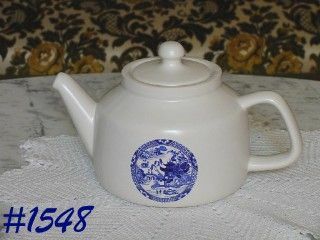 McCoy's Blue Willow items are so pretty as evidenced by this teapot! It's a beautiful matte white color with the colorful Blue Willow decal. Marked on bottom: 163, McCoy, Lancaster Colony (mark), USA. 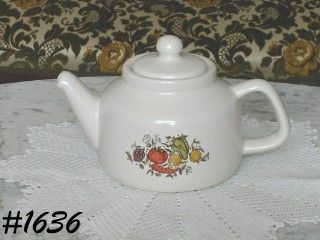 Teapot is in excellent condition -- no chips, no dings, no cracks, no crazing!